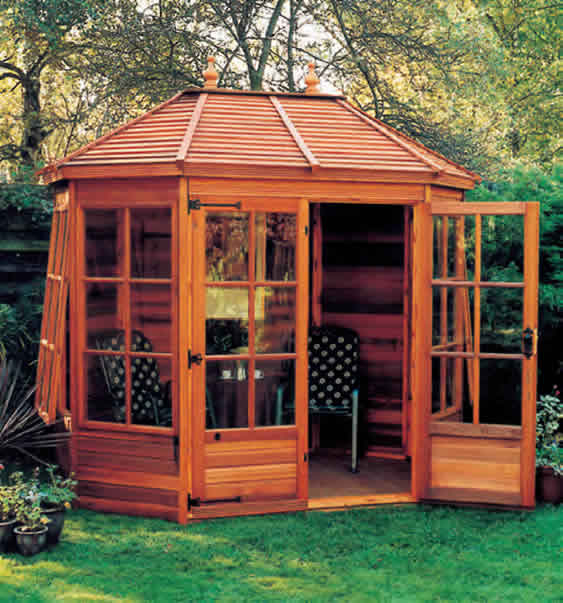 We supply and install the entire range of Malvern Summerhouses throughout the South East. We offer a FREE home survey to advise the most suitable type of building and can advise on things like bases, position and maintenance. Two (four on the 10’ x 10’ model) top hung fan light windows and a fixed window either side of the doors. Large pane glazing. Black antique ironmongery. Toughened glass. Solid timber felted roof. Locking doors. Spirit based timber treatment throughout. Two top hung fanlight windows. Large pane glazing. Toughened glass. Locking doors. 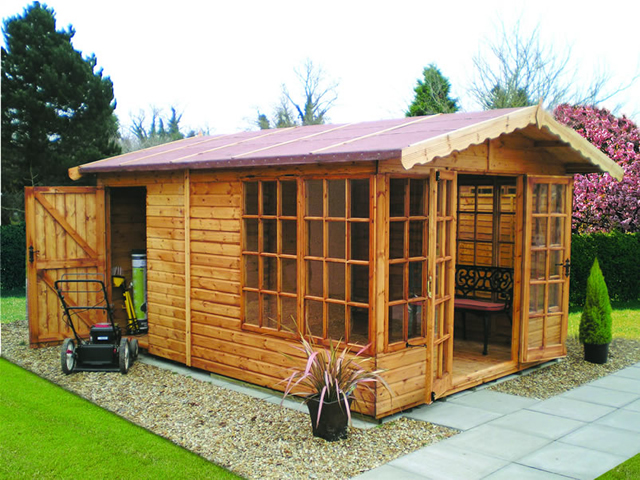 Spirit based timber treatment throughout. Pitched square fully felted solid pine roof. Two top hung fanlight windows (plus two fixed on 10’ x 10’ model). Large pane glazing. Toughened glass. Locking doors. 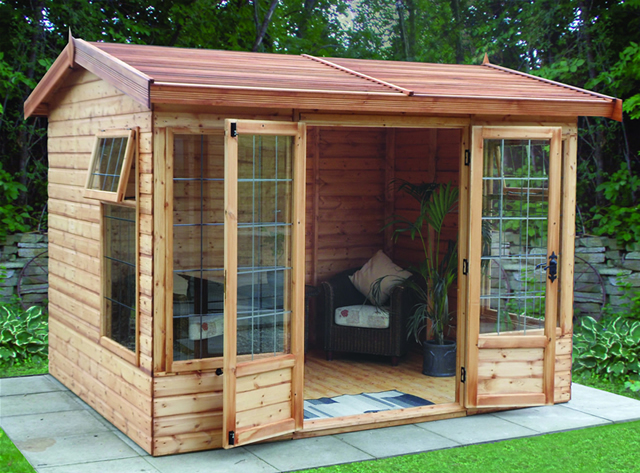 Spirit based timber treatment throughout. Fully felted solid timber hipped roof. Two top hung fanlight windows on both sides and two fixed windows on the front. Large pane glazing. Locking doors. Black antique ironmongery. Toughened glass. 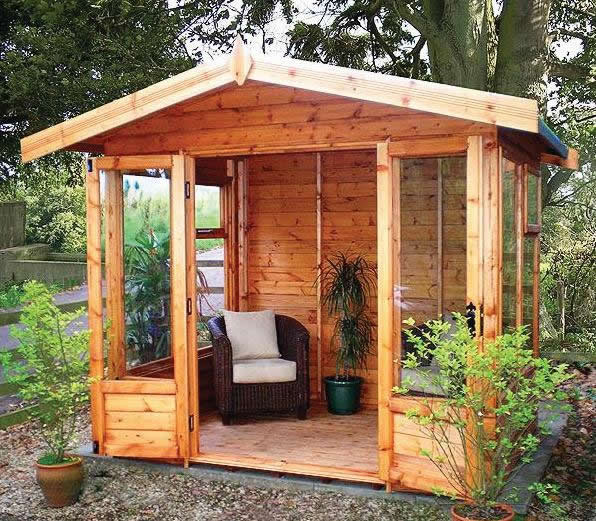 Spirit based timber treatment throughout. 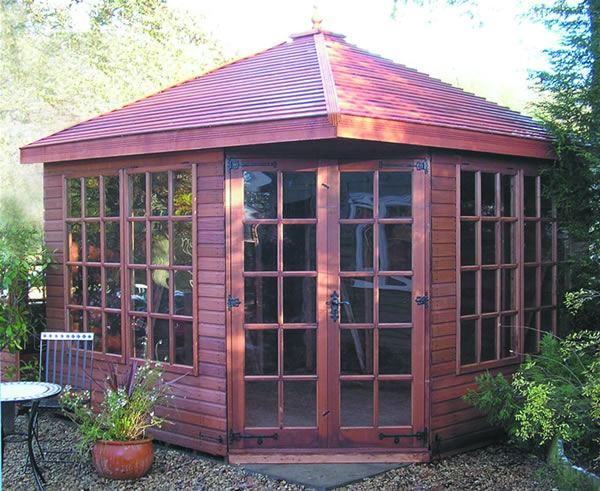 Apex style roof (under 2.5m in height). Locking double doors. Large pane fixed windows either side of doors. One opening window in each side. Toughened glass. Spirit based timber treatment throughout. Locking double doors. Large pane glazing. Straight roof. Toughened glass. 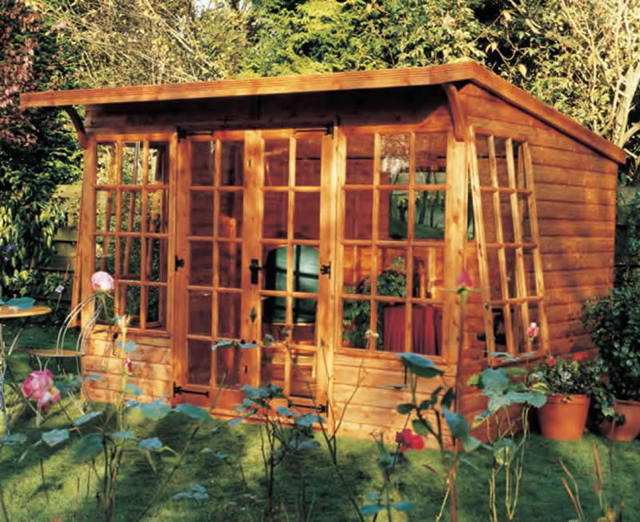 Spirit based timber treatment throughout. Glass to ground glazing. Locking double doors with a fixed window either side to the front and one top opening vent windows in each side. Toughened glass. 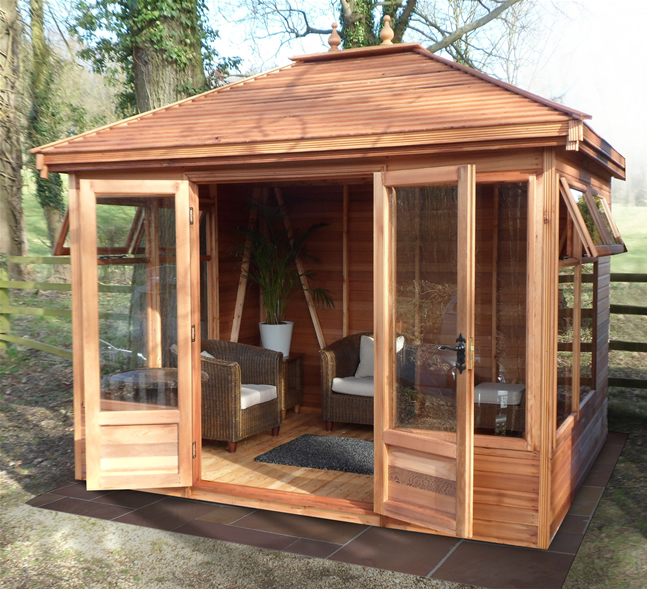 Spirit based timber treatment throughout. Toughened glass. Large pane glazing. Two front fixed windows and double doors. 7′ deep and under versions have one top hung fanlight window on both sides. 8′ deep and over have one fixed window and one top hung fanlight window on both sides. Locking doors. Spirit based timber treatment throughout. Four foot deep rear storage room with an opening window, accessed via a single fully ledged and braced lockable external side door. 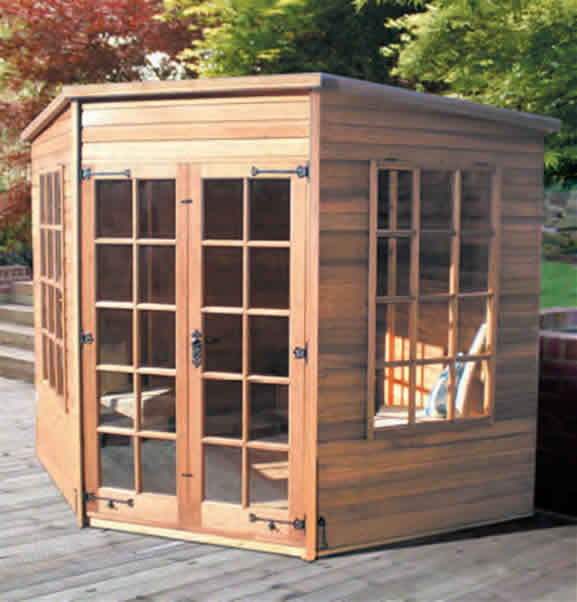 The summerhouse has lockable double doors to the front. Toughened glass. Fully felted solid timber roof. Large pane glazing. Two front fixed windows and double doors. 11′ deep and under have one top hung fanlight window on both sides. 12′ deep and over have one fixed window and one top hung fanlight window on both sides. 18” front roof overhang. 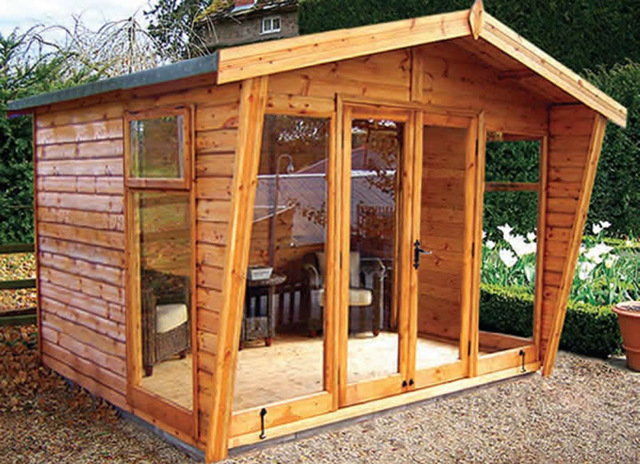 Spirit based timber treatment throughout.